The weekly magazine The Graphic first appeared on December 4th, 1869. 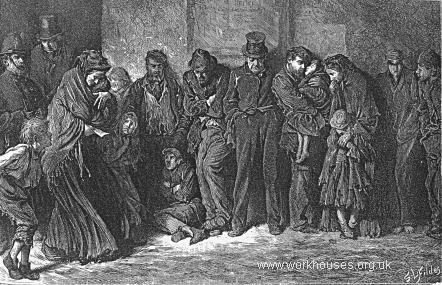 Its inaugural issue carried an article on the Houseless Poor Act, a measure that obliged Metropolitan unions to provide casual wards for "destitute wayfarers, wanderers, and foundlings". 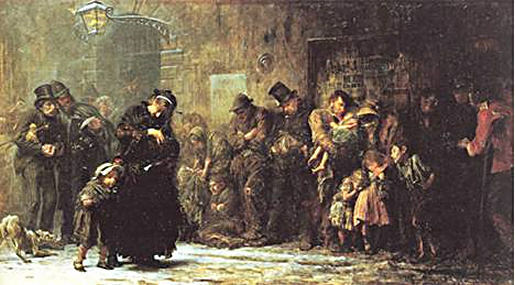 The accompanying picture, Houseless and Hungry, by Samuel Luke Fildes portrayed a line of homeless people applying for tickets to stay overnight in the workhouse. The engraving was seen by John Everett Millais who brought it to the attention of Charles Dickens. Dickens who was so impressed he immediately commissioned Fildes to illustrate The Mystery of Edwin Drood. Fildes soon became a popular artist and left The Graphic to concentrate on oil painting. Several of his early subject were later turned into paintings including, in 1874, a version of Houseless and Hungry called Applicants for Admission to a Casual Ward.